Yes, this episode has a good deal more meat to it than the previous one. It’s a really zippy half hour in which the Hood has another convoluted scheme to blow up a bunch of uranium processing plants while simultaneously abducting slave labor in the Himalayas to work in his own mine, while also leaving some “abominable snowman” footprints to frighten the locals into calling for International Rescue so that he can kidnap whomever they send. On the one hand, yeah, that’s about as convoluted and ridiculous a scheme as some of his other sixties tomfoolery – “Martian Invasion” certainly comes to mind. On the other hand, this is actually the only time that the Hood actually confronts our heroes in person in this continuity. He gets away and they never learn his name, but he straps Lady Penelope to a beam to menace her with a Goldfinger-style industrial laser, and then trades gunfire with Scott, who comes to the rescue. Stephen La Rivière directed this episode, and he and his team deserve credit for alarming our son for the first time in quite a while. The scenes of Lady Penelope threatened by the laser really did freak him out a little. 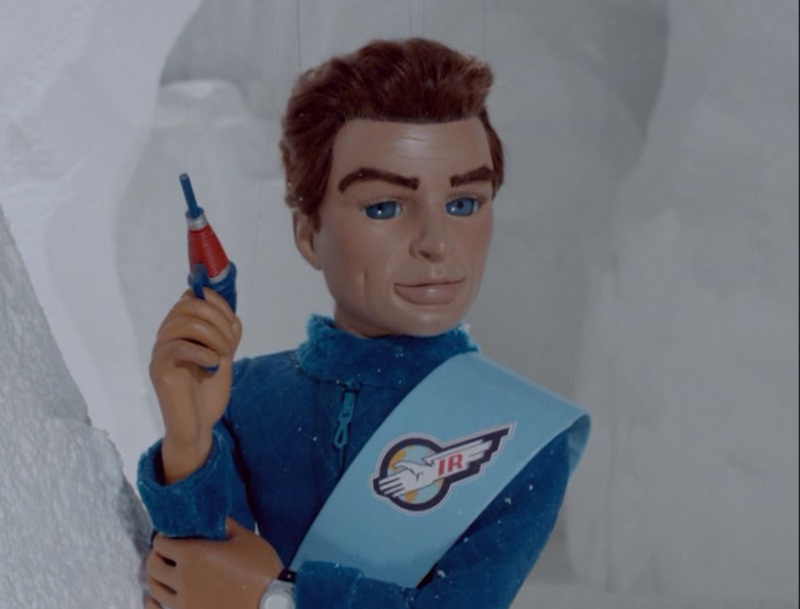 I can’t remember the last time that Thunderbirds had him worried. “Attack of the Alligators,” maybe? I thought the story was certainly slight and dated, but there’s not a lot that could be done about that. It’s probably a little more impressive than the original audio adventure, though. Bulked up with six or seven minutes of additional material, it actually starts with a big explosion-filled rescue at a uranium plant – named for Derek Meddings, which is awesome – using some dropped-in vocal lines for Scott and Virgil from TV episodes, and it looks fantastic. The Himalayas material also looks really good. There’s one medium shot of the puppets fleeing from the soon-to-explode mine – what happened to the prisoners? – where I think they’re moving a little faster than the marionettes ever did in the sixties, but otherwise it’s another very solid recreation of the original style, so seamless that you can easily pretend this was an original half-hour episode that Gerry Anderson and his team elected to shelve rather than bulk up to an hour when Lew Grade decided the show should be hour-long episodes. 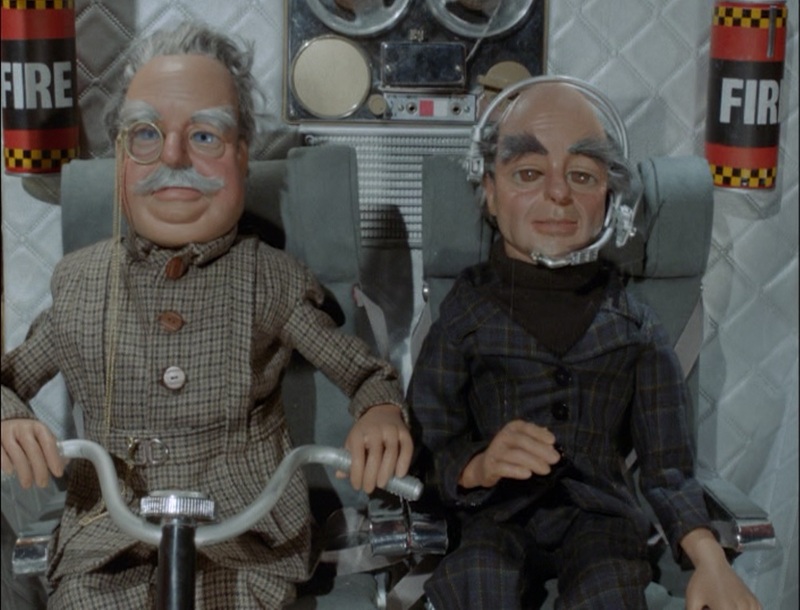 I don’t pay much attention to Kickstarter, nor use the service much, but when word got around last year that a team in England was making three new episodes of Thunderbirds with ITV’s blessing, I jumped up and got the checkbook. It was perfectly timed; not only was it the fiftieth anniversary of the series, but my then four year-old was falling in love with it. I’ve not seen Stephen La Rivière’s documentary about Gerry Anderson and the puppet shows that he and his team made in the sixties. It’s called simply Filmed in Supermarionation and features newly-shot footage in the original style. It served as a kind of pilot for this production, which is based on some old audio adventures. See, among the merchandise available in those days before home video, there were some 7-inch records, about ten minutes a side, which were full-cast recordings. There were several of these, and most were edited versions of TV episodes. But there were three that were specially made for the format, with the original voice actors. All that they needed were some visuals, and fifty years. To be fair, the first of these episodes is incredibly slight and unsurprising. The Thunderbirds launch sequences remain, after all these years, and after rewatching them again and again with my son over the last twelve months, dazzling, complicated, and ridiculous. With the film cleaned up and the color brought into vivid life like never before, however, they look brand new. Unfortunately, there’s really not a lot that strings them (heh, I said strings) together, which sort of emphasizes that launching each of the machines just to show Lady Penelope and Parker what they look like sure was an indulgent use of fuel. But it was the sixties. They thought gasoline would always be cheap and plentiful, no matter how many oil refineries got bombed into oblivion by the Hood or the Mysterons or the Aquaphibians or Joe 90’s enemies. No, this first episode is mostly an opportunity to see just how well La Rivière and his incredibly talented team have recreated the look and the feel of a fifty year-old show. It’s not unlike the eye-popping thrill of watching Vic Mignona and his team recreating the sixties in the Star Trek Continues web series and marveling at the seamless job, but I’m even more impressed by what La Rivière and the Pod 4 team have done. 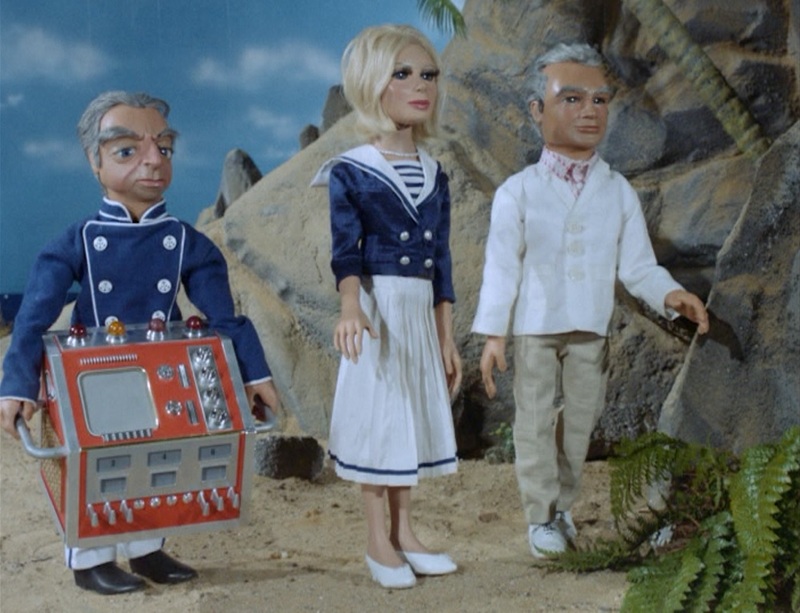 For all their talents, Mignona and company are not William Shatner, Leonard Nimoy and the gang, but these are three brand freaking new Thunderbirds episodes. They look like they were made fifty years ago, locked in a time capsule, and remastered yesterday. If the first story’s just a bit of nothing, the look is nevertheless perfect, and I’m assured the next two episodes, which we’ll watch very, very soon, have a tiny bit more meat to them.